Every child at some point in their school career has had to do a family tree project or report. The project may have been for social studies in elementary school or a history class in high-school. Whatever the age of the child, they will invariably need the help of their parents in putting the information together. Let’s face it. Most kids only know the most basic information about their parents, less about their grandparents and you’d be lucky to find almost anyone who knows the names of their great grandparents. Your child will turn to you for the answers. Here are some things you should and shouldn’t tell them. 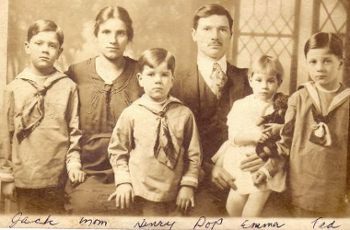 Many adults know very little about their family history. Some don’t realize how very little they know until their child starts asking them questions. Before you get started helping your child build the family tree, or write the report they need to do, do a little research yourself. Research doesn’t necessarily mean going to a historical archive and digging up a record of your great grandparent’s marriage. You can do some down and dirty research by simply asking your parents or grandparents (if they are still alive) for some of the basics. Make sure you have a pen and paper handy when they are talking so that you can write down the important parts like names, places and dates. Make sure to ask where grandpa was born and where grandpa and grandma met. Ask what religion they were and make a special note about why they may have left one country to go to another. Children’s reports or projects usually only require basic information. It’s the stories that are more interesting then anything else to the child and the teacher so don’t get carried away tracing your family back as far as you can. Get the basics of who is who and a few good family stories and you’ll be set to help your child do their project. Remember that when helping your child with their project, you want to keep it appropriate for their age. Their may be family stories that are not appropriate for them to hear. Furthermore, some stories they may not understand and it may put their grandparents or other relatives in a bad light for them. Sometimes our trips down memory lane remind us of unsavory things that relatives did. Try to filter that information from your children and remember that your dynamic with certain relatives is not their dynamic. When putting together a family tree, many people get caught up in the challenge of how far back they can go. If you want to take up genealogy as a hobby, it can be a very rewarding experience but your child’s report only requires basic information. Have the child start by putting their name at the bottom of a piece of paper. Let them fill out as much as they can by themself. They should obviously be able to add their parent’s and sibling’s names. If they get stuck on grandparents then give them a hand. The important part of the project is to get them interested in the hiearchy of the tree and who came from who. Once they see who came from who and how different families connect to each other it may ignite a more mature interest in their family history, culture, traditions or religion. You might think it’s great that you can track all your second and third cousins but most other people will not be able to understand the relations and will simply find it boring. Help your child put together the most basic of tree — usually just going back to grandparents. If they are interested in knowing more then let them ask the questions that interest them. Try to get your child to think. Genealogy and figuring out relations is actually very confusing to most people. It requires a certain way of thinking. Don’t hand everything to your child on a silver platter. If they can figure out relations on their own it will help them do the project but it will also help them develop problem solving skills and develop reasoning skills that will help them later in life. Helping Your Kids Do A Family Tree Project For School was posted in Learning, Parents and Teachers by Guest Author.